Rabies vaccine is required to protect pets and people but the shot can cause serious vaccine reactions which homeopathic Lyssin can prevent or minimize in your dog. We have to do it. It’s the law! 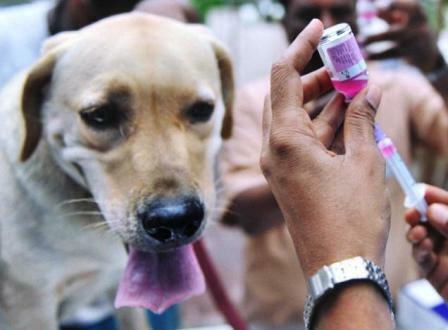 The rabies vaccine is protection for our dogs and their owners. Rabies can kill an animal that is not protected, i.e. vaccinated. Now we learn that there is contamination of some of the vaccine produced by a leading manufacturer. Really scary stuff. Before vaccinating my dogs this summer, I will check to be sure that my vet doesn’t use vaccine from that company. Does that really insure against contamination from another company’s product? Next month we go to have teeth cleaned and get rabies shots for those that are due this year. I will have a vial of water that contains several dissolved pellets of Lyssin (Hydrophobinum) 200C ready to give to each dog before I leave the vet’s office. The Vet who cares for my dogs is aware of my use of homeopathic remedies and agrees that it can be of help for my pets. She doesn’t use them herself but allows me the freedom to keep my animals as healthy as possible. The Lyssin does not inhibit the protection that the dog receives from the vaccine. What it will help is disorders that can and often do result from the injection. Vaccines are supposed to create a mild case of disease in the body. It is a fact that some animals will have ill effects and some will have lasting personality changes. Rabies is a Latin word meaning rage or fury. Think of how a rabid animal behaves. There is aggressive behavior, attacking any object or animal in their way, even friends & family. A perfectly happy puppy before the shot may become a stranger to its family after the shot. Good news is that the remedy will work if given to the animal months after being injected. Lyssin can make life better and safer for dog and master. The bad news is that Lyssin (Hydrophobinum) is not available from your neighborhood health food store. You would have to locate a vet who has homeopathy as part of his practice. Another source would be a local study group in your area. There are many groups that meet on a regular basis to share information. Today you can order homeopathic kits online for less than the cost of an office visit. Google for "Lyssin 200 cc" and you may find a supplier. If you cannot find help, feel free to contact me and I will try to find a reference for you in your community. Your dogs would do anything to protect you. Knowledge gives you the power to protect them. Editor's note: There are many complimentary/alternative remedies for dogs and people. Homeopathy is safer than prescription drugs and often just as effective.